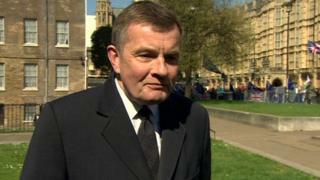 “My vote is a matter between me and the ballot box,” David Jones, MP for Clwyd West, told BBC Wales. EU leaders are deciding later whether the UK’s Brexit date should be extended. Mr Jones said the prime minister should be ensuring that the UK leaves the European Union “as quickly as possible” and that the current situation is “humiliating, not just for the prime minister herself but for the country as a whole”. He said if European elections take place in the UK because of a delay to Brexit “it’s going to be a pretty farcical situation” and that many Conservative Party members would be “reluctant to participate” in the vote.